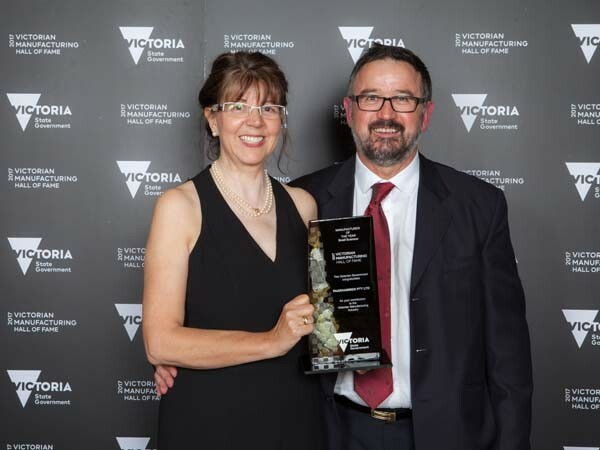 Paarhammer Windows has been awarded ‘Manufacturer of the Year – Small Business’ 2017 by the Victorian State Government. A long manufacturing history, staff training and education, innovation and the use of the latest technology, combined with several industry ‘firsts’, the sustainable features of the factory, and community involvement, were all mentioned during the award presentation. The Manufacturing Hall of Fame Awards, established in 2001, recognise individuals and companies who embrace new technologies and manufacturing techniques, are export (or in this case import replacement) focused and excel in business innovation. 'Growing Advanced Manufacturing' was the theme of the 2017 Victorian Manufacturing Hall of Fame Awards. “We recognise outstanding achievements in a wide range of world-class businesses that continue to make Victoria both the heart and brain of Australian manufacturing," said the Hon Wade Noonan MP (Minister for Industry and Employment). Paarhammer has now been recognised as an innovative and forward-thinking business. Established by Tony and Edith Paarhammer in 1990, Paarhammer Windows - a family owned and operated company - is the first Australian company to develop and patent bushfire-resistant windows and doors for the highest bushfire attack level, BAL-FZ, tested and approved to Australian Standards. Paarhammer has also been setting the benchmark for energy efficiency in Australia from the purpose-built factory in Ballan, which features sustainable waste, light, and water management systems, and using the latest in technology like Francesco the spray painting robot. Paarhammer places a strong focus on staff education and community, and since its foundation, 35 apprentices have been trained in-house in conjunction with Federation University Ballarat. Other staff members have completed further certificates in manufacturing, and study trips overseas to learn how to make aluminium clad windows, now manufactured locally by Paarhammer. Paarhammer Windows has received numerous awards over the years, and was honoured to receive this award on behalf of their employees who strive to deliver exceptional service, and meticulously crafted windows and doors for energy efficiency and bushfire safety.